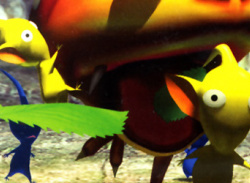 Nintendo sprouts a new kind of fun with Pikmin, available exclusively for NINTENDO GAMECUBE. 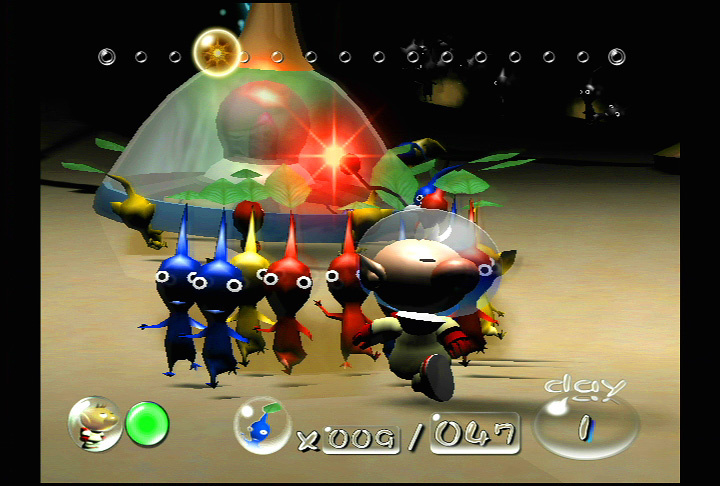 Created by legendary game designer Shigeru Miyamoto, Pikmin is an inventive life simulation and action-strategy title that pushes the limits of the imagination, offering fast-paced 'thinking' action while teaching players the importance of caring for and nurturing creatures to create a symbiotic relationship. 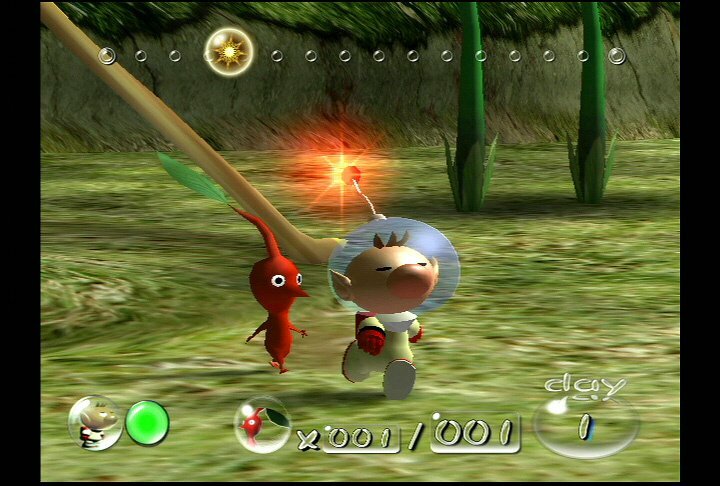 In Pikmin, players take on the role of an intrepid spaceman who crashes onto an unfamiliar planet after a comet collides with his spaceship. The space explorer must collect the vessel's lost parts, which are scattered throughout the planet, while relying on his silver spacesuit to protect him from a deadly poisonous atmosphere. 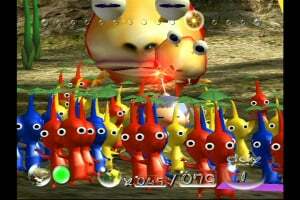 Fortunately, help is readily available in the form of Pikmin sprouts - small, indigenous plant-like creatures that offer more than meets the eye. 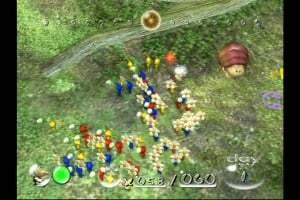 Players can control Pikmin sprouts individually, in groups, or as one vast legion of more than 100 Pikmin sprouts on-screen at one time. The Pikmin sprouts prove extremely useful when fulfilling missions such as carrying objects back to the base camp, defending Pikmin nests, defeating enemies and building bridges and roads. Thwarting the effort are numerous alien beasts that safeguard valuable items like pieces of the spaceship. "Thinking about what would be fun is our fundamental aim, and with the very imaginative Pikmin adventure, we have created a new genre of gameplay unlike anything players have seen before," says Mr. Miyamoto, General Manager of the Entertainment Analysis and Development Division and Director for Nintendo Co., Ltd., and considered the world's foremost video game designer. "After playing Pikmin, kids will want to explore their own backyards in search of Pikmin sprouts." 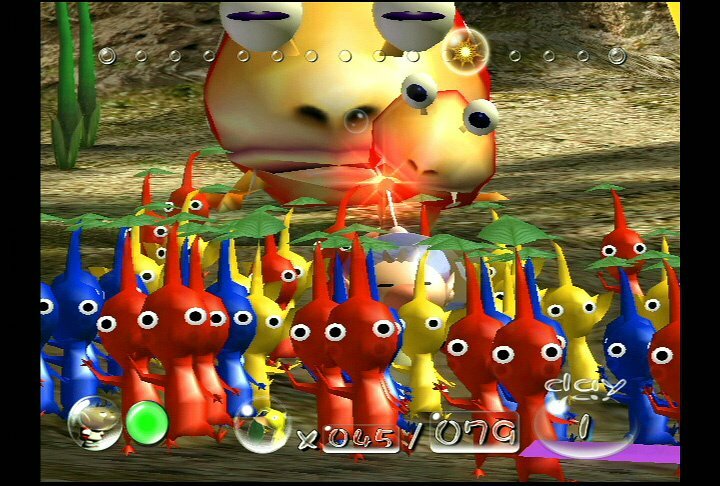 Pikmin is a race against time. Players must make sure all the Pikmin are not destroyed. They must also carefully monitor the remaining life of the spaceman. 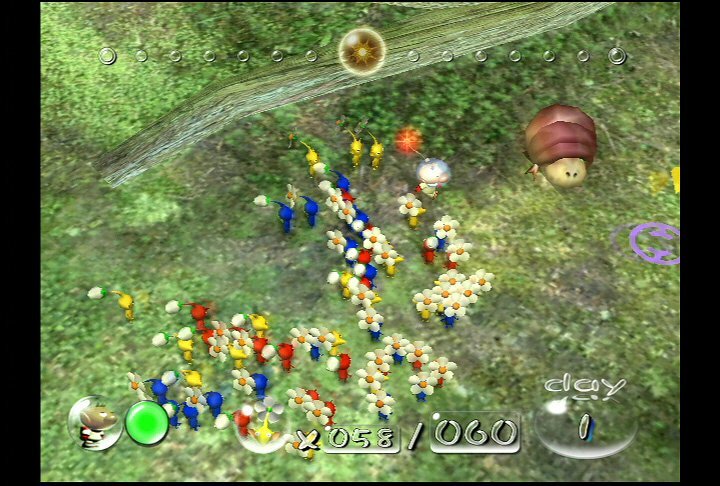 With practice, players can rear Pikmin sprouts of different colors, then train them and watch them grow into three different forms - leaves, buds and flowers. 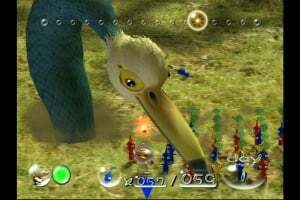 With real-world floral imagery and ultra-realistic backgrounds, the unique world of Pikmin is brought to life by the NINTENDO GAMECUBE system's expressive graphic powers. Scenery changes as the sun moves across the sky, plants waver as the Pikmin brush by them and dust clouds rise beneath the legions of stomping feet. Prepare to immerse yourself in lush, real-world landscapes that are home to hundreds of creatures and objects - all simultaneously moving in different and unique ways. "Pikmin takes real-time strategy to the next level, putting players in unfamiliar environments where they must learn strong management skills and long-term planning in order to succeed," says Peter Main, executive vice president, sales and marketing, Nintendo of America Inc. "NINTENDO GAMECUBE was built to bring games like this to our customers." This game is AWESOMLY good! Lots of people dislike this game, and that makes me sad. SUPER SAD! If u dont like this game then it's your loss. 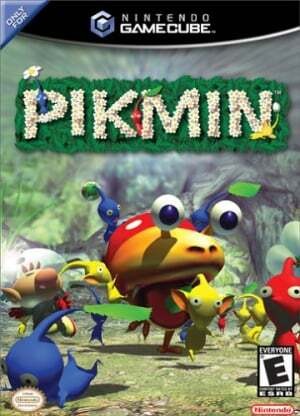 If you've never played it, play it and also play the 2 sequals, Pikmin 2 and Pikmin 3!